Most red light therapy products on the web today are designed and marketed to sell you your youth back. To eliminate those fine lines and wrinkles. To bring back the spring and the glow to your skin. You read the promises and see the before and after pictures, and it all seems way too good to be true. I’ll be straight with you. It is true. Red light therapy can really do most all that they promise. Here’s how. 1. Increases circulation and the formation of new capillaries. (references) This brings an immediate healthy glow to the skin, and paves the way for you to maintain a more youthful and healthier appearance, as new capillaries mean more oxygen and nutrients to each skin cell every day. 2. Increases lymph system activity. This reduces swelling and puffiness. These results would also be noticed after the first and each subsequent treatment. 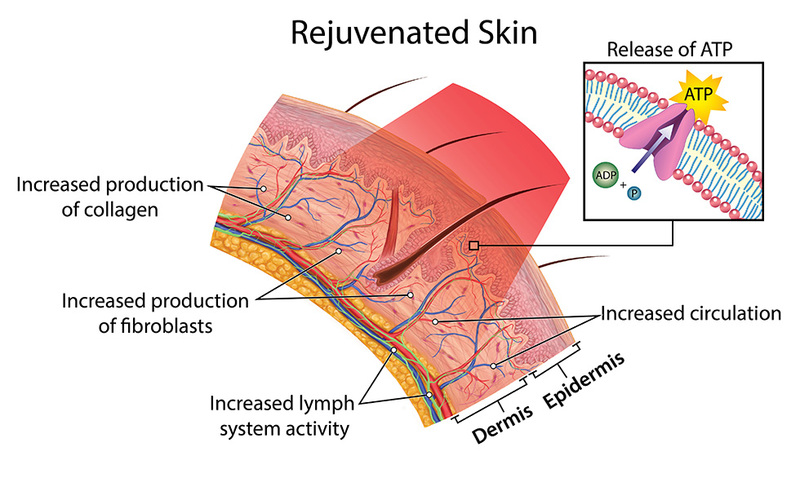 Again, this paves the way for less puffiness in the future as the lymph system is actually made more efficient over time, resulting in healthier skin overall. 3. Stimulates the production of collagen and fibroblasts. 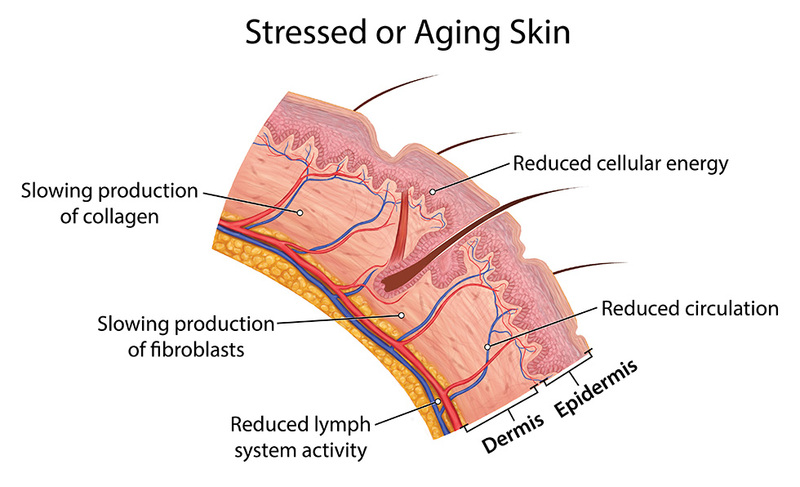 Collagen is what is responsible for the elasticity, firmness, and fullness of your skin. The increased production of collagen and fibroblasts is what will smooth out your fine lines and wrinkles, smooth the texture of the skin, and reduce pore size over time. Collagen cells grow slowly, so be patient, and expect to see “before and after” results at about three months of consistent treatment. 4. Causes the release of ATP, or raw cellular energy. This provides energy to the cells to make the most of the additional blood, oxygen, nutrients, detoxification, growth, and repair already initiated by your red light therapy treatments. Add all that to the already impressive list of benefits red light has to offer and you have no reason at all not to give it a try. You will be directed to cleanse your face in order to remove anything that could block or interfere with the light. You will shine the light on your skin for a period of time ranging from 90 seconds to 20 minutes depending on the product you choose. Treatments are recommended once daily until the desired result is achieved, then reduced to twice weekly to maintain the results. The treatments are painless, in fact, it’s most likely that no sensation will be felt at all. You can apply makeup or other skin care products immediately after your treatment is done. A topical antioxidant is not necessary for good results, but has been shown to help produce better results faster. You’ve seen all those before and after pictures – but let’s set your expectations properly. 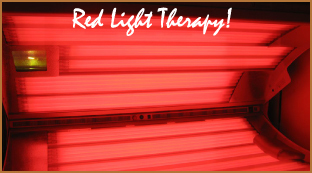 After a red light therapy treatment, certain things happen right away, and certain things take longer. For example, you will have a healthier, more radiant glow about your skin within minutes after each treatment. Use this to your advantage and, instead of doing your treatment before you go to sleep, do it before you go out. The imperfections that you gained slowly over time will fade in the same way – slowly, over time. Gradually, uneven redness and spider veins will diminish. Collagen and elastin will grow slowly with each treatment, gradually smoothing out those fine lines and wrinkles. This happens so gradually you might not notice it, but others will. It might help to take a picture before you start, and another 8 weeks later, so the progress will be more obvious to you. It will take about 8 weeks of consistent treatment for “before and after” type of results.